Welcome to another edition of the 99signals Interview Series where we feature stories and business advice from successful bloggers, marketers, and entrepreneurs. 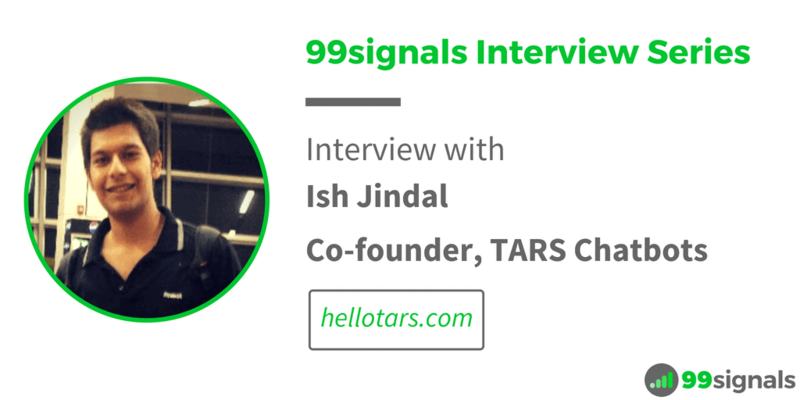 For this edition, we caught up with Ish Jindal (@jindalish), co-founder of TARS Chatbots. 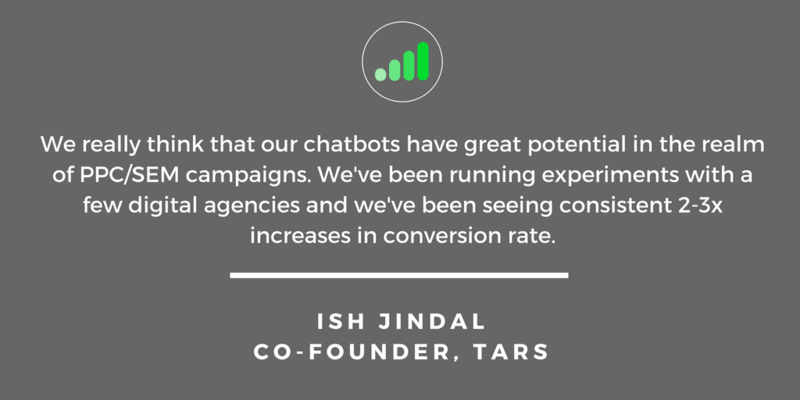 TARS is one of the most popular chatbot builders in the world with 9,000+ bot creators and 15,000 chatbots created using their platform. 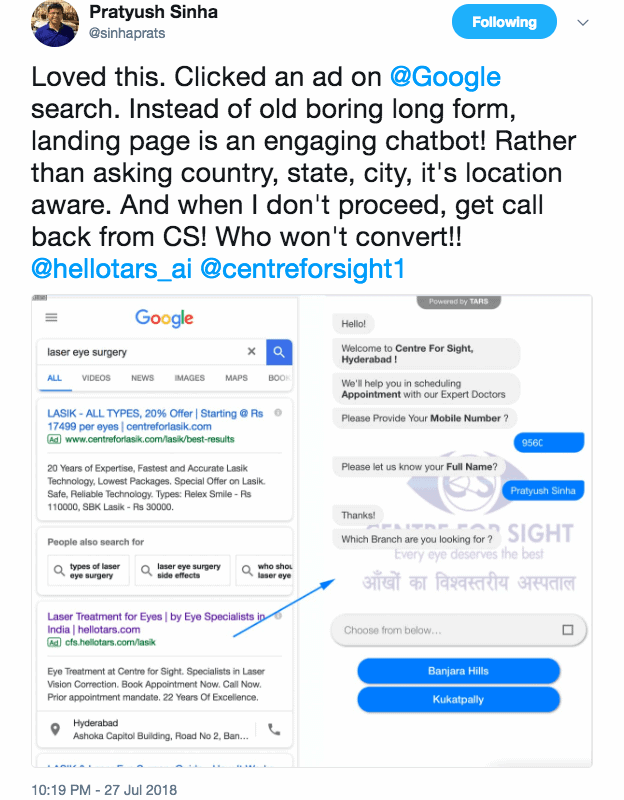 At 99signals, we designed our very own content marketing chatbot a few months back using TARS. We’d like to thank Ish for taking the time out of his busy schedule to answer our questions. Q: Can you share your journey so far? What led a graduate in civil engineering towards conversational interfaces and bots? Yes, you are right – I graduated in Civil Engineering but have never really worked in that domain. I have always been excited about building a product and then creating business around it. I started off working on side projects since I was in freshman year and I believe that is what led to this journey. After graduation, I worked for a year in consulting firm, quit that to work on an experiential travel startup called Padhaaro. Back at Padhaaro, we were essentially connecting inbound travellers with locals who were offering tours and experiences. What we saw was these people were interacting a lot on WhatsApp asking questions about what to do in the city, what to buy etc. which felt trivial since every traveller was asking the same set of questions. And we wanted to build something which could automate these conversations. It started from there and then with Tars, we have been able to democratise this experience of automated conversations between businesses and users to a large customer base now. Specifically automating structures conversations thereby replacing forms. So yes, this is a bit about the journey. Tough to put it together in a few lines. Q: What kind of problems does TARS solve for businesses? Our customers use chatbots to solve a variety of different business problems from lead generation and qualification to booking meetings/appointments to customer support automation and a lot more. But we have found that the most popular use case of our chatbots is by far lead generation. 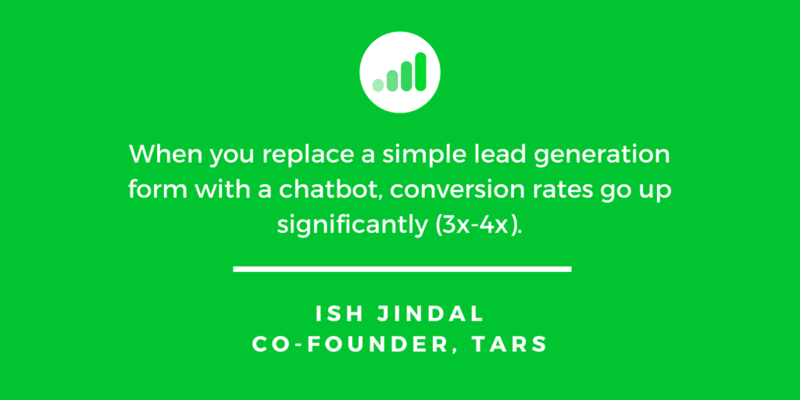 When you replace a simple lead generation form with a chatbot, conversion rates go up significantly (3x-4x). This phenomenon is a validation of our initial vision with the product. When we started Tars, we wanted to solve the problem of increasingly arduous web forms. For the last few months, we have been focusing on a specific subset of this use case: AdWords Landing pages. A few of our customers have been using chatbots as landing pages for their PPC/SEM campaigns, and have been seeing phenomenal results (60% drop in cost per lead, 3x conversion rates). We think this segment is truly promising and can add real value to businesses the world over. Q: It’s a common notion that chatbots are mainly used for customer facing experiences like navigation, customer support and more. Can bots be used for automating internal aspects of a business? Absolutely. One of our customers, Pazmental, has effectively used chatbots to structure their internal data. The company provides at-home nursing and hospice services for senior citizens. Before using Tars, their caregivers would manually write their observations about each patient in a notebook and then enter their observations into a computer at the Pazmental offices. The system was a mess. It was time consuming, and since the data was unstructured, the company found it difficult to track and report specific patient health metrics. To solve this problem they created a chatbot, which asks caregivers a structured set of questions they can answer on their phones at the end of each patient visit. The data is automatically entered into Pazmental’s systems on the backend, and since caregivers provide their observations in a structured manner Pazmental can track patient health and provide weekly insights to the patient’s family. Q: There are several case studies listed on the TARS blog. What has been the most interesting case study till date? Sure. Let me share something very recent. Last week we published a case study about FastCashStrips (FCS), a US-based company which buys and resells extra glucose-testing strips from diabetes patients. Other than the fact that I learned about a new industry, I found the usage of chatbots in that case to be interesting. Usually when talking about software, there is a tendency to think in terms of discrete use cases. A chatbot is either a lead generation chatbot or a customer support chatbot. FCS, however, broke through this paradigm. They recognised that different aspects of a business often feed into one another. In this case, they found that individuals were far less likely to appraise their testing strips when they did not have full information about the process. As a result, instead of completing transactions they would send a contact request. The company had a traditional FAQ page but let’s be real, who actually reads those. To solve the problem, FCS created a chatbot that served as both a lead generation tool and an FAQ page. Prospects who are ready to complete a transaction are redirected directly to the page where they can get a quote for their strips, while uncertain prospects can ask the bot a question, before being redirected to the quote page. The results have been amazing – conversion rate has gone up 2x from 7% to 13.8%. Prospects who interact with the bot are twice as likely to complete a transaction than their non-conversational counterparts. Q: TARS is already changing the way businesses function. Where do you see TARS five years from now? Following up from my answer to the first question, we really think that our chatbots have great potential in the realm of PPC/SEM campaigns. We have been running experiments with a few digital agencies and we have been seeing consistent 2-3x increases in conversion rate. We truly believe that conversations will be the future of PPC/SEM campaigns and we want to be a part of it. Q: It’s a popular phrase that ‘AI is the future of digital marketing.’ Can you share your views on the subject? Look there is no denying that AI will be a huge part of the way businesses interact with prospective customers. The technology has great potential and with companies like Google leading the charge, it is inevitable that AI will be a big part of marketing in the future. That being said, I would caution businesses against thinking of AI as the ultimate solution to all problems. In the context of chabots for example, I believe that the true value lies not in the AI which underlies the software but the UI of the software. Think back to DoNotPay, the conversational agent which helped squash over 175,000 traffic tickets for aggrieved citizens in the US and UK. When most in the media spoke about it, they billed it as a complex AI lawyer system that would argue with the government on behalf of aggrieved citizens. In reality, however, the bot asked for the same information that would have otherwise been filled into a boring government form, in a more conversational interface. No AI involved, just some UI magic. Q: TARS is offering the standard monthly plan at $99 per month. Is this sufficient for new business owners and agencies to automate various aspects of their business? It really depends on how many conversations you expect your bot to have. If you are an SME who is just starting out and gets a handful of leads everyday, then the standard plan will work just fine for you. If you are an agency with multiple clients or a bigger company however, we would highly recommend a higher plan, purely for the API integration feature. This feature will let you integrate your bot with your preferred software tools and help you build really dynamic and powerful conversations. Q: What new products and features can we expect from TARS in the near future? The very next thing we will be working on is adding more integrations with External Apps. Both to send the conversation data collected from the bots, and to fetch data from these apps, and use it in the Bot conversation. As a company, we are completely focused on the idea of Automated Conversations. We believe that there are tons of innovative things can be done in this space. Therefore, we envision the application of ML and AI to build features that can make the conversation more effective towards the goal of the Automated Conversation. Q: TARS took customer engagement to the next level with the introduction of bots that can speak with different accents. Do you really believe that AI can consume all of human consciousness and eliminate human effort in future? No. Everyone has an opinion on this topic, and my opinion is on the optimistic side. I think AI will definitely take over a lot of human effort and free us to do something else. I’m not sure about what that something else would look like though. But I believe it will be something better. Q: If you could only give one incredibly valuable advice to upcoming business owners, what would it be? Be patient and trust the process. Things take time to materialise. To learn more about TARS and to build your own chatbots, visit their website. If you liked this interview, please share it on Twitter using the link below or share on other social channels using the social share bar on the left.